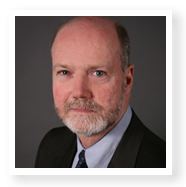 Named Executive Director of the New York State Smart Grid Consortium (NYSSGC) in April 2013, James T. Gallagher brings over 35 years of energy policy and industry experience to his role. As Executive Director, Gallagher oversees the Consortium and its members as they work toward broad statewide implementation of a safe, secure, and reliable smart grid to modernize New York’s energy infrastructure. Gallagher is the architect of the NYSSGC’s priority initiatives, which are designed to modernize New York’s electrical grid to improve reliability and resiliency, lower long-term costs, and identify best practices for meeting the evolving energy service needs of consumers. He recently co-facilitated the stakeholder process for Market Design and Platform Technologies for the NY Public Service Commission’s Reforming the Energy Vision (REV) Proceeding. Prior to joining the NYSSGC, Gallagher served as Senior Manager for Strategic Planning at the New York Independent System Operator (NYISO), where he was responsible for establishing the long term strategic direction for the NYISO, which operates New York’s electric transmission system and wholesale power markets. Before joining the NYISO in 2011, Gallagher served as Director of Energy Policy for the City of New York, and he was the lead energy advisor to the Office of Mayor Michael Bloomberg. Prior to working with the City, he was Director of the Office of Electricity and Environment for the New York Public Service Commission, where he enjoyed a 21 year career, and held senior energy policy positions at Northeast Utilities, the Pennsylvania Governor’s Energy Council, and in the late 1970’s, the Tennessee Valley Authority. At TVA he developed and led the organization’s pioneering “Solar Homes for the Valley” program. Gallagher is a member of the Advisory Board of Grid4EU, the largest smart grid project funded by the European Commission. Through this effort, Gallagher collaborates with international energy and technology experts to learn and create best practices and technological solutions for grid modernization. Gallagher also serves on the EPRI Grid Modernization Advisory Group and sits on the Board of Directors for the Advanced Energy Research and Technology Center. He is on the Executive Advisory Committee for the U.S. Department of Energy’s State and Local Energy Efficiency Action Network. He earned a B.S. in Business and Economics from Lehigh University, and an M.S. in Energy Management and Policy from the University of Pennsylvania. To read my newsletter messages, please click here.